Since we started construction, 10 months ago, we have experienced a challenging learning curve. Logistical and shipping slowdowns combined with unforeseen challenges have caused construction delays. We are confident that throughout this year the changes and adjustments that have been made put us in a better position than ever to move forward with the construction. As the rains slow down and the dry season begins, we expect the pace of development to speed up dramatically. Key personnel are now in place to help with the project administration and accounting. Bank accounts and processes are in place to facilitate payments. Architectural and engineering plans are much more advanced and ready for implementation. Final infrastructure and utility network engineering and plans have been completed and are ready for installation. Electricity has been installed to the construction site. Adjustments to the development schedule and improved construction plans have been established so that next year’s wet season will not adversely affect construction progress. The following is a brief overview of progress at the Levera development over the past 6 months. To facilitate accessibility throughout the Levera project site and especially to the Seaside construction area, we have been cutting new roads and improving the main accesses. Although hundreds of hours of work, and hundreds of trucks of rock and gravel have been brought in and drainage culverts installed, the roads are still not to the standard we expected, and additional work is planned over the next few months. The roads were improved dramatically, but still caused problems for the transportation of material and shipping containers to the construction site. We believe that we have now identified the causes of the roads, which can become slippery with deep mud and water after heavy rains, and we will be prepared for next rainy season. The work done today, although not sufficient, will serve as a base moving forward. During the first construction phase, the roads will continue to be compacted dirt and gravel, which will serve as a solid base for when the final roads are installed on top of the current roads. To facilitate the construction of the larger buildings of Turtle Beach Hotel and the Orchard Cottages, a new, more direct road has been cut through the bush, and will also be fortified this dry season. For the past year, the construction at Levera has been working with generators for needed electricity. Although common in construction, the generators provide only a temporary solution. Initially, we had considered running single phase connection to the construction site, but after looking at the number of poles and cabling required to run the power to the Seaside development site, we contracted a full commercial 3-phase connection. 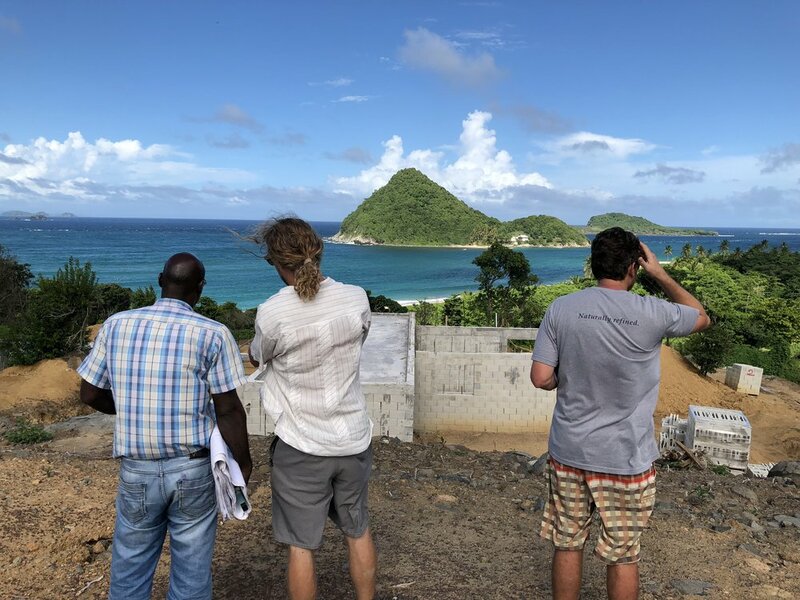 Although the resort will generate much of its own power through solar panels, batteries, and other alternative efforts, it is essential to be tied to the island electrical grid. 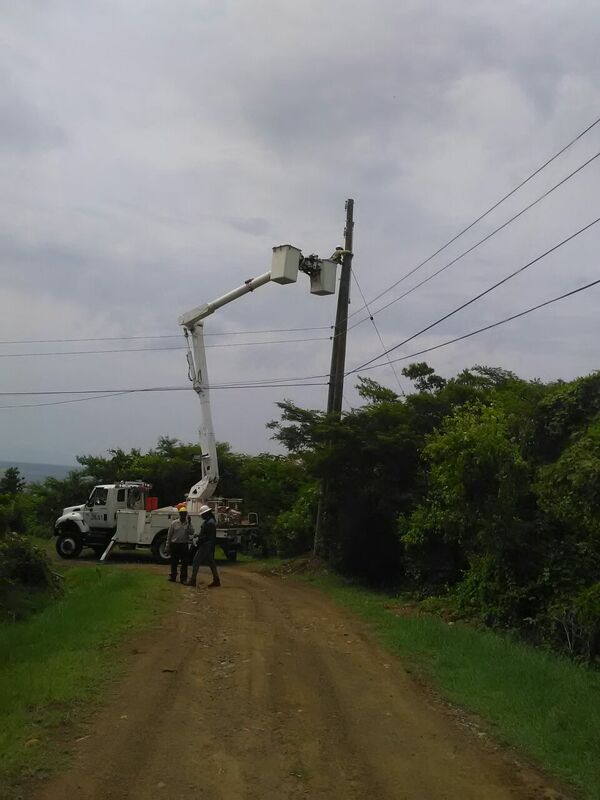 This connection will allow us to tap into the local grid for additional energy when needed, and in turn, return power to the gird when we are producing more electricity than we need. All electrical cabling and network inside of the Levera project will be underground. Connecting to the island power grid is done with traditional posts and above ground wiring. Running from the Sautaurs (la Fortune) side, GrenLec has installed nearly 20 posts and all cabling to connect power to the Development site. The 3-phase electricity will be linked this week after a planned final inspection by the government. As we have been moving forward with the development, we have noticed a few variations with our topographic maps of the property. The topography maps we are using were provided to us from the land seller, and although they are mostly correct, they were done years ago without clearing all of the foliage and plants. The original plans are generally correct, with most places varying only a few inches, but in other areas, we have found discrepancies of more than 10ft in elevation. The new topographic plans have allowed us to complete significant slope retention work in the Seaside area which has now been finished. In order to move forward, we did an entirely new detailed topographical plan of the first 50 acres (phase 1) of the development. This new elevation map was labour intensive as it required much of the land to be cleared of underbrush to allow sight lines and get specific points and elevation. With this redone map, final placement of buildings and infrastructure can be now completed. The newly re-surveyed land also allowed the delineation of the 10 acres that will be needed for the Turtle Beach Hotel. These 10 acres will be titled to the new hotel company, allowing for the entity to own, develop, and operate as separately, thus giving investors additional security to their investment. Resort utilities, such as the freshwater and wastewater catchment and treatment system, need incredibly detailed elevations to work correctly. All plans for utility infrastructure for the Seaside area have been completed and are ready for installation of water, power, communication, and sewer as soon as the rain subsides. The Seaside sewage treatment plant has been designed by a cutting-edge USA based company with extensive experience in wastewater treatment system design. The firm specialises in the use of Low Impact Development and Design (LID) principles for innovative stormwater, wastewater, and site planning projects. 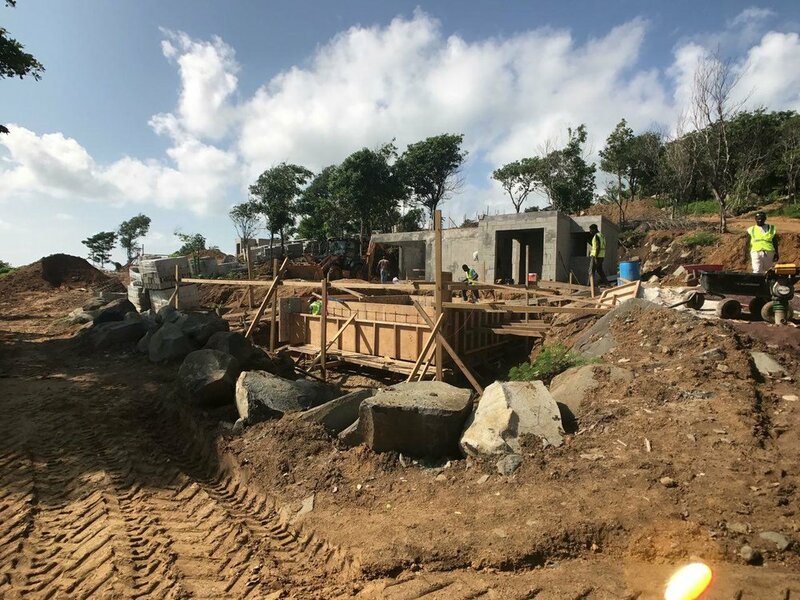 The system being built for Levera Seaside will collect the wastewater into settlement tanks, where the separated liquids are pumped up to a bacteria and plant-based organic treatment facility. The treated water is completely safe and will be re-used for irrigation. During high tourist season, it is projected that the Seaside area alone will produce 5,000 gallons of irrigation water per day. Reusing the wastewater in this manner will help to keep Levera green all year and limit our overall water usage. Not to drop names, but a Caribbean island owned by a well-known eccentric billionaire has a similar system built and installed by the same design team we are using. The Seaside wastewater system is scheduled to begin construction around the new year. 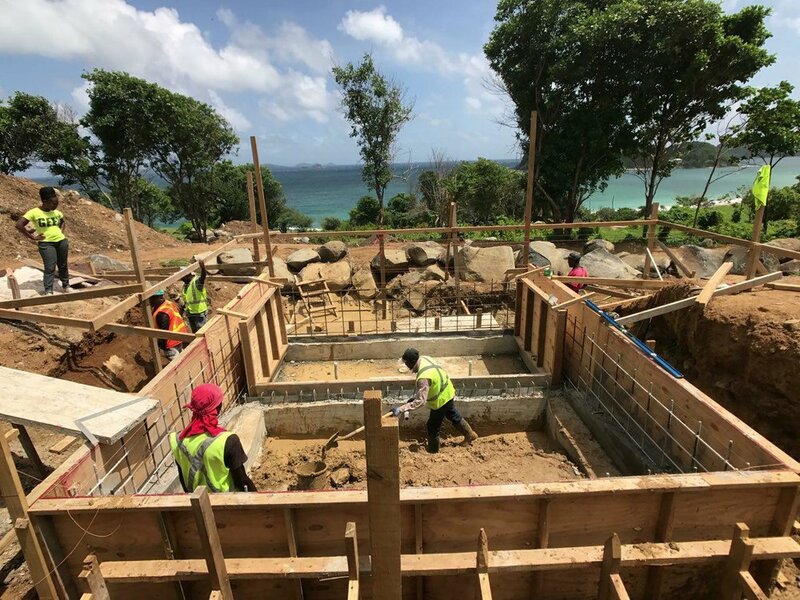 Construction on the 14 Seaside cottages continues to progress, with many cottages either at the foundation level or ready for roofs and interior finishes. 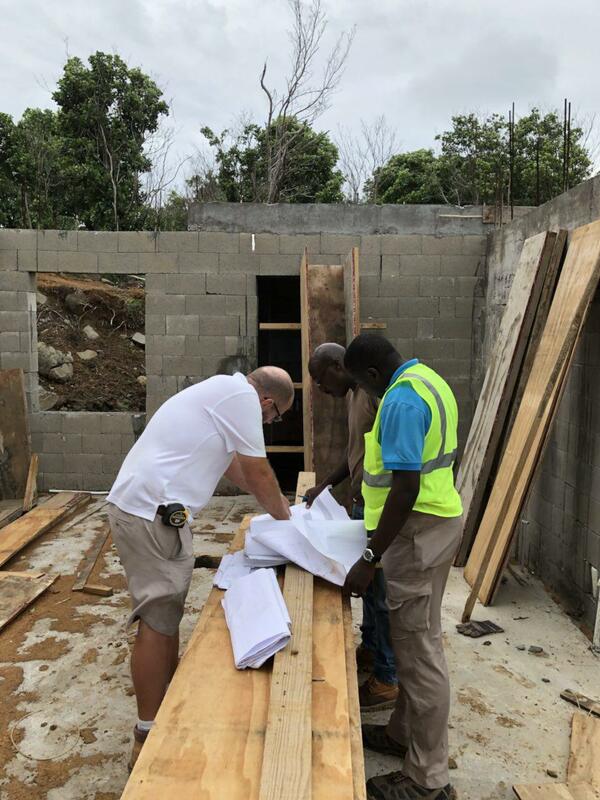 We originally planned to have the roofs on some of the units before the rainy season started, but due to some logistical shipping issues, were not able to complete this before the rains began, and we decided to wait until after the hurricane season to install the roofs. The Cottage roofs are a mix of old and modern worlds. Handcrafted in Indonesia, the longest beams span over 40ft and resemble hand-carved beams. Due to the lengthy span, the beams are steal wrapped in old-growth teak and then hand carved with traditional Caribbean designs. 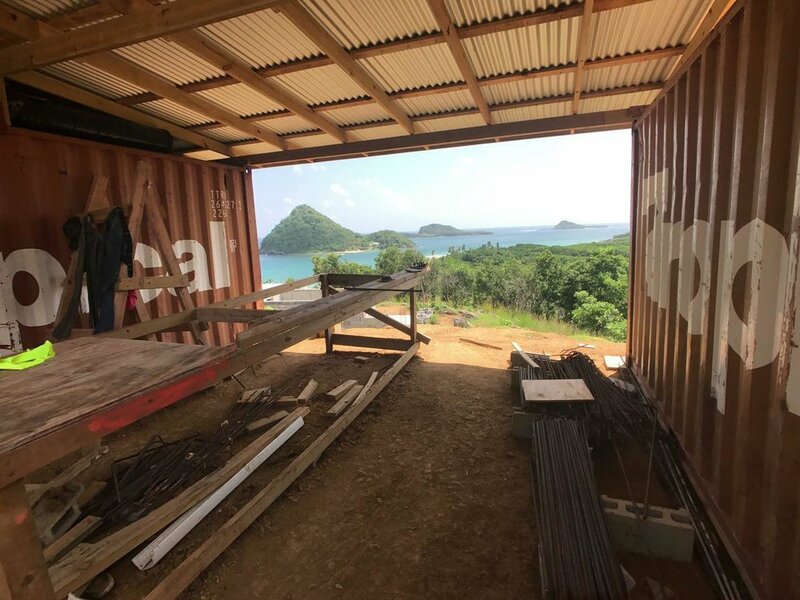 This structure type allows for a rigid base for the roof to be built upon, which is beautiful to the eye while providing an extremely solid and durable structure through tropical conditions. On top of the roofing beams, a traditional wood structure of old-growth teak beams support tongue and groove Southern yellow pine wood sheathing. The roofs are then covered with a thick bonded multi-layer synthetic membrane called Sharkskin. This sealant, which replaces tar paper, will not absorb moisture or rot and creates a secondary water barrier in case roofing material is lost or damaged from high winds, providing long-term protection. Atop the roof, we will be installing hardwood shingles from Guyana. Top grade Turada, a regional hardwood, gives a very traditional Caribbean look and can last up to 40 years. 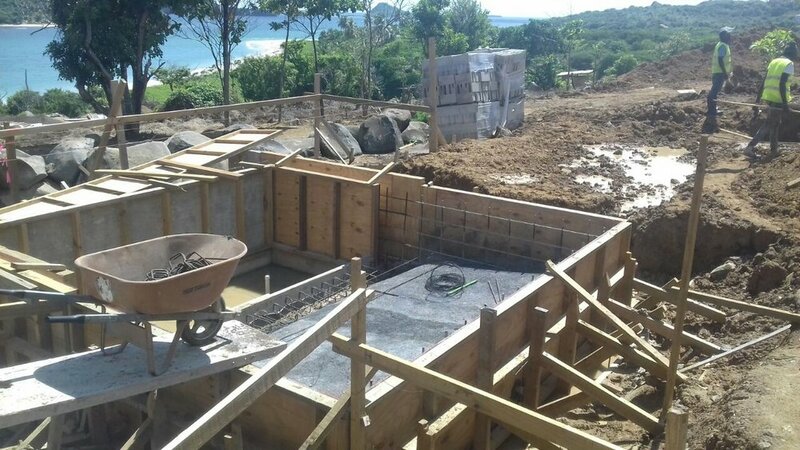 The roofing materials are now on island, and installation of the roof columns and footings began last week. We expect to have the first roofs on the cottages by mid-November 2017. And the rest of the roof installed over the next 6 months. After the roofing, we begin the luxury interior and exterior cottage finishings. Coralino, a sandstone with embedded seashells from the Yucatan peninsula, will be the main flooring for the outside and bathrooms. The Coralino flooring, cut to our specifications, as well as the Mexican Cantera stone to be used on the pool borders, is being shipped together. Each Seaside Cottage will have a unique stone bathtub featured in the oversized bathrooms. 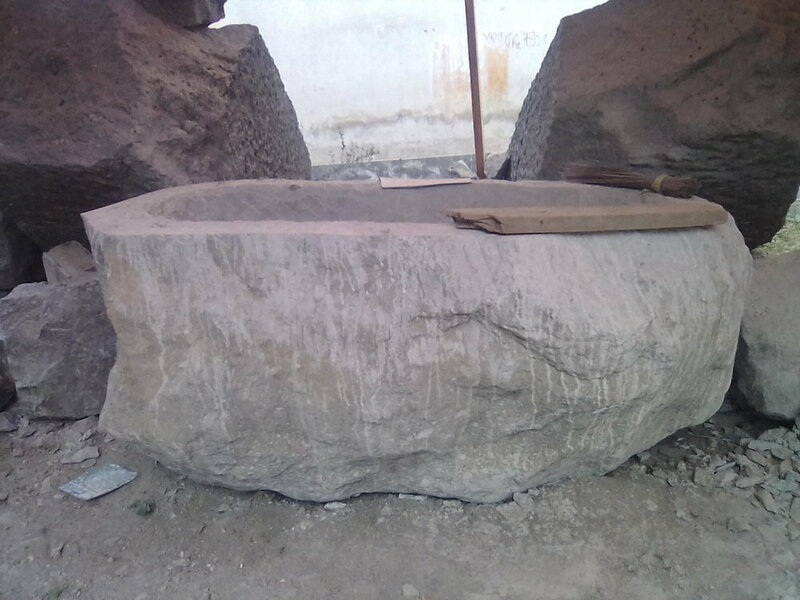 These bathtubs are carved from a single piece of stone and are so large that the bathroom walls will not be completed until after the tub is installed, as the tubs will not fit through the doorways. 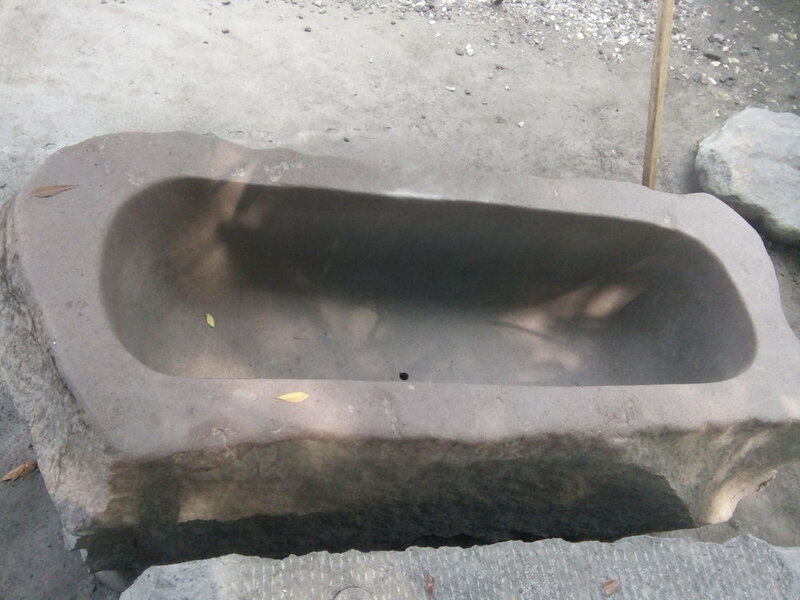 A very unique and natural piece, the solid stone bathtubs will be a highlight for the hotel rentals. The main bedrooms in the Seaside Cottages will have a floating wood floor made of Ipe, a South American hardwood. Similar in appearance to mahogany, Ipe is popular for its durability and beauty as a warm, rich, hardwood. Three times harder than cedar, Ipe is an Eco-friendly 100% natural wood, which resists surface scratches, mold, fire, weather, and is pest-resistant. 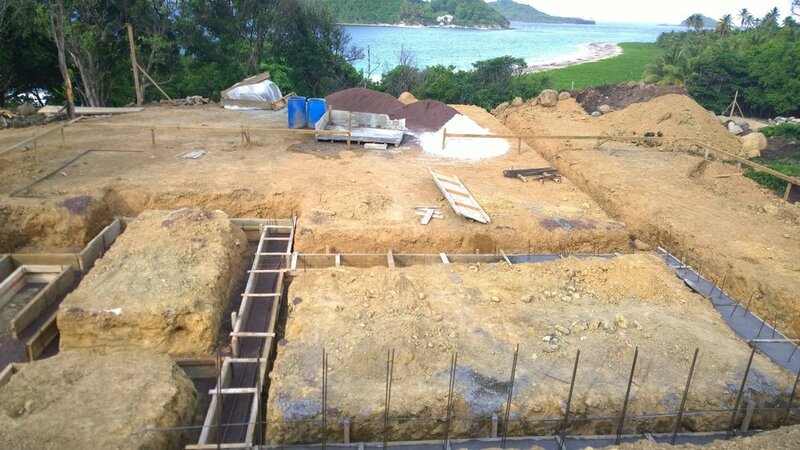 The first pools for the Seaside Cottage are currently in construction. Each Seaside Cottage will have a private pool with a gentle beach slope, into the deep end. Pools will be finished with a plaster highlighting the hand-painted edge tiles surrounded by the Cantera stone. We are currently forming the concrete walls of a 1- bedroom and a 2-bedroom pool, and have dug out space for 2 more pools. Once we have experience finishing these 2 pools and the rain slows, we will continue with the construction of the other Cottage pools. The solid wood custom doors for the Seaside Cottages have been completed and are on site, waiting for installation after the roofs are installed. Wood windows and air portals have already been constructed and will be installed with the cottage finishings. Custom furniture for the Seaside Cottages is being built, and the first container will be shipped the first week in November. Custom hardwood and rattan furniture has been designed for the cottages and includes built-in closets, desks, free-standing tables, chairs, vanities, etc. Instead of standard concrete blocks, we are using a unique building system for the Seaside Cottages. Endura blocks (www.endurawalls.com ), although made of concrete they are specially designed with an insulated insert, which will dramatically reduce the transfer of heat and sound. This building system, which is slightly more costly than typical construction, will reduce energy costs, ensure that the cottages are private and intimate, while also providing incredible protection against hurricanes as the block and sealing protectant is nearly impenetrable. The construction technique is unique, and experts from the Endura company have been at Levera trailing the Levera construction team to ensure proper installation. The learning curve has slowed down the construction process, but we now expect that the fully trained teams will be able to build in high-speed format. The Endura blocks used to date have been imported, which has caused logistical delays due to shipping constraints. 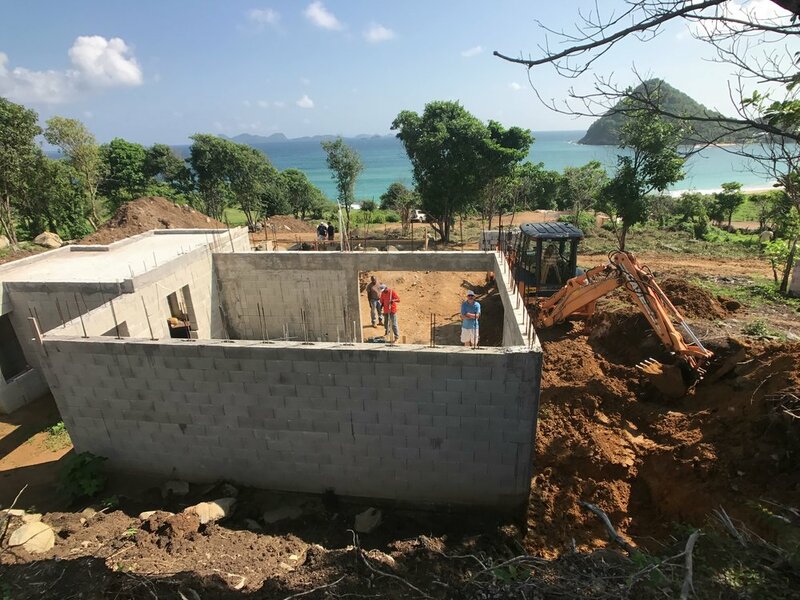 We plan to use the Endura block in all constructions moving forward and have purchased the mold to begin making the block on island, thus eliminating the logistical headaches. 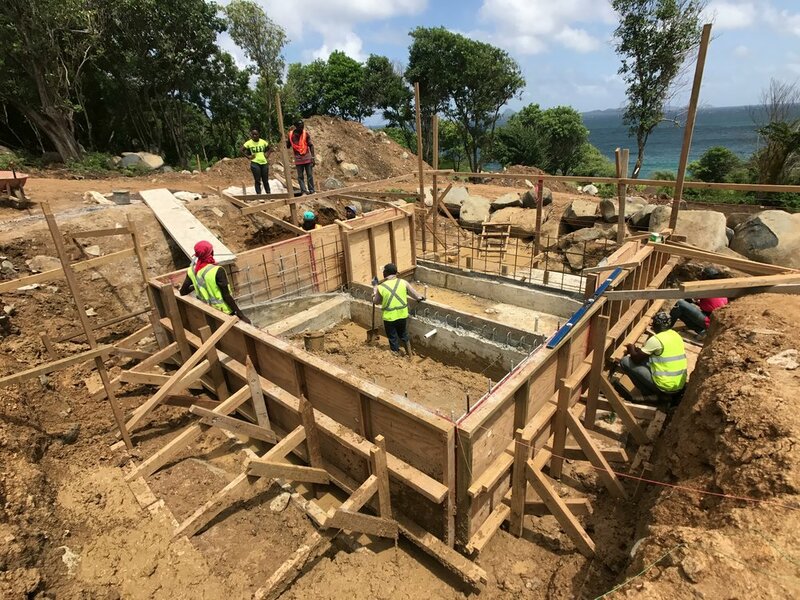 A local concrete company has been contracted to produce the blocks in Grenada and should start producing the Endura block in November. The Landscaping and Farming team has been working hard throughout the raining season. A plant nursery has been established to start baby plants and grow them before being used in landscaping throughout the property. 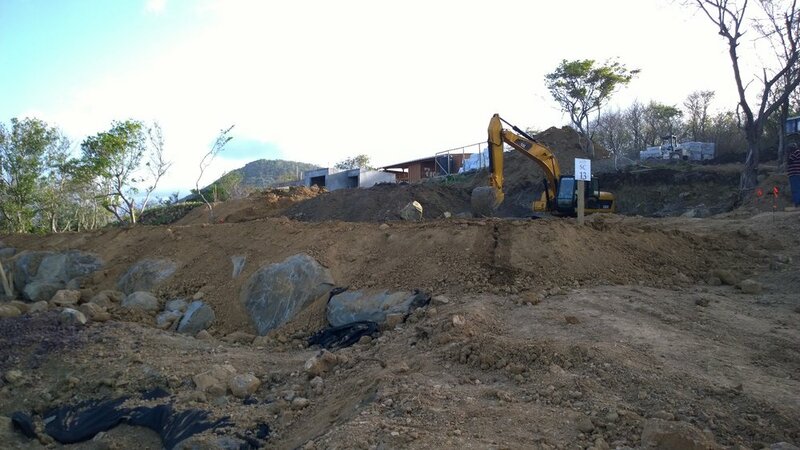 We are going to need an almost uncountable number of plants to landscape the property and plant the orchards. Having our own nursery on site will dramatically reduce our expenditures for plants. We currently have a few acres of farming and orchards planted on the property and will continue to expand the orchards and farming over the next couple of years. 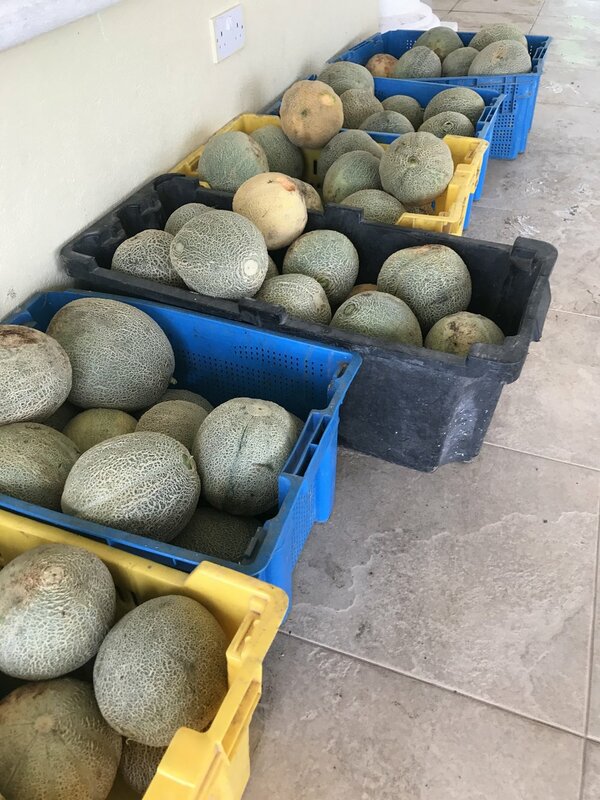 Last week we had the first harvest of cantaloupe and watermelon, but we have planted citrus, mango, banana, and many types of tropical fruit- which will soon be abundant throughout the property. Plans for the Beach Club, which is part of Turtle Beach Hotel, have had a few modifications as we have been trying to maximize views and preserve trees on the property. The final plans for the Beach Club include a large 80ft free spanning arch, which will be unique to the Caribbean and an architectural focal point. The lot has been staked and will be cut for the foundation as soon as the rains settle (end of November or start of December.) We are currently reviewing the final plans and have met with construction companies, as well as our current General Contractor to bid on the construction. We plan to be in full Beach Club construction by January 2018 and complete the building for the 2018-19 tourist season. Part of the bidding process for the Beach Club includes bidding on the larger hotel buildings of Turtle Beach Hotel. The design of the beachfront H2 Building, which includes 8 hotel rooms and features a green roof similar to the Beach Club, has been completed and is now in structural engineering. Buildings H3 & H4, which is the centre of the hotel functions, including 65 hotel rooms, lobby, restaurant & bar, multiple pools, office administration, and back of the house operations is close to being finished architecturally. The buildings will be sent to the structural engineers next month, with detailed construction bidding to follow. The modern design will have a hybrid green roof that will stair step down the bluff allowing each part of the building spectacular views of the ocean and the Levera Peak. We are in the final stages of negotiating a construction loan which will allow us to move forward with the H1, H2, H3 and H4 buildings- of which we hope to have foundations in before the next rainy season- and allow us to work through the next summer with fewer rain delays. The existing Clubhouse is scheduled to be renovated and converted to include a Sales & Info Centre, small café, and Art Gallery. The Art Gallery will spotlight local Grenada artists, and Doliver, a native Levera artist, will be showcased starting in December of this year. The renovation will include updating changes to the floors, doors, ceilings, lighting, furniture, and new interior and exterior paint. The Clubhouse is a local favourite for special events such as weddings and celebrations, and the renovations will allow these events to continue even as we add new functions, such as weekly Farmers Markets. The Clubhouse is scheduled to open this December. 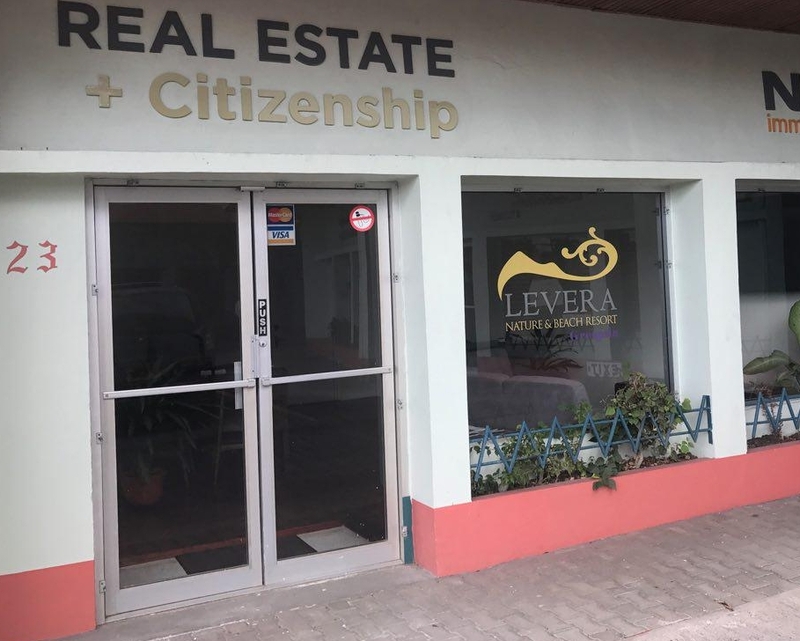 Levera Nature & Beach Resort has opened a sales and administration office in the south of Grenada. The Gran Anse sales and Info Centre is now working and staffed during work hours. This office is crucial in managing the various aspects of the development as the south of the island is the main population and government centre in Grenada. Located in a plaza with many restaurants frequently visited by locals and tourists alike, the Gran Anse office will generate significant buzz and provide information concerning the resort to the heavily trafficked south.